Property Size 3,151 sq. ft.
Durango Colorado vacation rental home known as Cliff View House near Purgatory Resort. 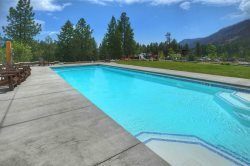 This beautiful home with expansive views of glacier-carved cliff rock outcroppings, mountains and forest is an excellent retreat with large, open living and dining rooms, a wrap-around deck and large bedrooms, sitting atop a wooded hill in a quiet, rural neighborhood the Rocky Mountains. While staying at this home, guests are in the beautiful San Juan Mountains of Southwest Colorado. The views from the deck and many windows feature the majestic Hermosa Cliffs, carved by glaciers long ago. To the South, viewable above the forest of aspen and evergreen, is the Animas Valley just outside of the town of Durango. The three bedroom, three bath home is large and roomy with three private bedrooms, a loft, large deck, recently updated kitchen, plus large living room and dining room. A gas grill is located on the wrap-around deck that takes in panoramic views of the forest and cliffs between Durango and Purgatory Resort. The open, contemporary, living space includes a recently updated kitchen with countertop dining, adjacent to the six-seat dining room for total dining seating of up to ten people. The living room and dining room feature huge windows that reach from floor to 24 foot cathedral ceiling, offering views of the surrounding forest and majestic cliffs to the west of the home. A wood-burning stove and large TV add to the comforts in the living room, and the large deck is accessed via glass doors from this room. Bedrooms include the master suite on the upper level of the home with king size bed, desk / home office nook, and recently remodeled ensuite bath replete with a large, walk-in shower that is washed with mountain sunlight via the skylight over the shower area. Bedroom 2 on the main, ground level, is large but comfortably cozy with king size bed and cottage decor. A large, bath with roomy walk-in shower is just a few steps away. On the lower level, bedroom 3 includes two twin beds and plenty of floor space for air mattress making a great ‘hideout’ for kids young and old, with gaming-ready TV. This bedroom has its own exterior exit to the back-of-house outdoor area, and a 3/4 bath with shower serves the lower level. The open loft overlooking the living and dining room includes two futon beds; one full size and one twin/single size, which creates a nice bonus lounging and sleeping area. Located 30 minutes from downtown Durango, Colorado and 11 minutes from Purgatory Resort. Enjoy all the San Juan Mountains have to offer in both winter and summer. Outdoor activities abound, skiing, snowboarding, sledding, cross county skiing, hiking, mountain biking, cycling, horseback riding and fishing. Explore Mesa Verde National Park about an hour away. Ride the Durango and Silverton Narrow Gauge train. Soak in the hot springs at Trimble or Ouray. Drive the Scenic San Juan Byway one of the most scenic drives in the country and visit Silverton and Ouray. PLEASE NOTE: Although the roads are well maintained, in winter months (October through April), It is NECESSARY that you have a 4x4 four-wheel-drive vehicle, vehicles with medium to high clearance and winter/snow tires to access this beautiful alpine, Rocky Mountain home. During a typical winter, this home receives a LOT of snow. Roads are well-maintained, but the home is NOT accessible without the proper vehicle that is equipped with good all-weather or snow tires. Please contact us before booking with a pet. Small dogs considered, under 25 pounds with prior approval. Please contact us about larger dogs and multiple dogs. A 30-minute drive to the south will take guests to Historic, downtown Durango, Colorado. This home is on the San Juan Scenic Skyway, which is an incredibly scenic driving loop that connects Durango, Mancos, Mesa Verde National Park, Telluride, Ouray, Silverton and Purgatory, as well as many fantastic trails for hiking, mountain biking, fly fishing and other Rocky Mountain adventures. Winter visitors will be about a 11 minute drive to the main entrance to Purgatory Ski Resort while still finding themselves in a quiet alpine mountain neighborhood with easy access and 24 hour check-in availability. In summer, there is an abundance of hiking, biking and 4x4 trails in the very close by as well as in the San Juan Mountains which surround the resort area. Motorcycle enthusiasts will encounter a flat, gravel parking area immediately in front of the home, and well-maintained gravel roads to and from the paved San Juan Scenic Byway, which offers a popular scenic drive for motorists of all kinds. Serious road cyclists with find the paved highway north to Silverton or south to Durango to be scenic and challenging routes, and mountain bikers have many choices of trails that allow bikes, and hikers are minutes from a vast array of high mountain hikes. Horseback rides and more await summer visitors, and this home is a very convenient location to winter activities including skiing and snow boarding at Purgatory, snowmobile tours in the high country, cross country skiing, horse drawn sleigh rides and more. Cliff View House is surrounded by tall aspen trees making a most spectacular site for fantastic views during the golden fall color of autumn. Suzanne was amazing! She was very helpful and always available to help with everything from answering a question to helping with our car problems! Thank you again Suzanne! The front door lock was a problem. It wouldn't work half the time. The refrigerator wasn't working either. Regardless our visit was amazing and we had a blast. Please note there is a security camera located outside near the front door, back deck and one facing the water cisterns. There are no other cameras in the home. The camera are not monitored during guest stays except to watch water levels.